The band enters without playing and lines up ready to begin at the START LINE. Depending on the size of the group, bands may enter straight on may turn to the start line. The Start Line will be clearly marked at the zero yard line in the end zone. Band will come to a full stop and wait at attention to be called to perform. The Announcer will notify the band when the judges are ready. The circuit begins at the zero yard line. Adjudication begins at the first sound heard from the band as they enter the first street of the circuit. During their performance the band is to maintain forward direction and continue in the line of direction of the circuit. While in the circuit the number of band files or ranks may stay the same or vary in number at the discretion of the band. During the performance music is to be continuous. Only right and left turns are required in the circuit. A band may utilize any type of turns performed in any form and style of their choice. When the first member of the band reaches the exit line the band continues to toward the track and exit gate. When the last member of the band crosses the exit line all adjudication ceases. The exit line is at the zero yard line. The band continues to play and march in formation until the last member of the band reaches the exit line. 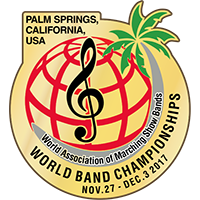 ALTERNATIVE END: A band may elect, without penalty, to present themselves with a front face ending centered on the 50 yard line. Judging would end there before exiting in the same direction of previous march to the exit line. After the last member of the band crosses the exit line, the band stops playing and comes to a full halt and will receive directions to leave the field.